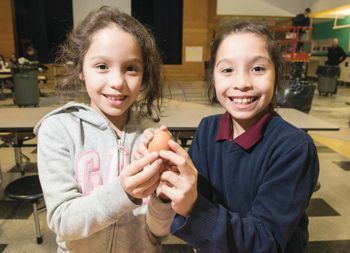 Twin sisters Eliana and Edlyn Hernandez (8) unwrap their vessel to see if their egg is still hard boiled or scrambled, and the twins find success – one intact egg. The twin sisters were just one group out of many that joined in on the Kelly School’s STEM Night Egg Drop experiment last Thursday, Jan. 31. Students used math, science and engineering lessons to create a protective cover for their egg, which was then dropped from a 30-foot crane.